The Vatican is developing guidelines on how to address the fate of churches and the sacred treasures they contain after being abandoned due to economic challenges and low attendance. Source: Crux. “It’s a cultural and pastoral phenomenon of great importance,” said Italian Cardinal Gianfranco Ravasi, head of the Vatican’s Pontifical Council for Culture, at a press conference on Tuesday. “You see it in the parish priest who is in difficulty and doesn’t know what to do, creating gelato shops, garages, pubs, or even worse,” he added. The cardinal referred to a case in the Czech Republic where a Catholic church was transformed into a night club, but there are many others. The Dominican Selexyz Church in the Netherlands today hosts a library and cafeteria. The Church of San Lorenzo in Venice, Italy, is now a concert hall. 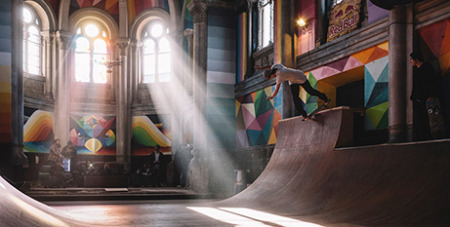 The Church of Santa Barbara in Llanera in Spain has been refurbished with psychedelic art to welcome skateboarders. While in these cases churches maintained at least the power to unite the community and bring people together, in many others, spiritual spaces are left in disrepair or forgotten. That’s why the Vatican’s Pontifical Council for Culture, the Italian Bishops’ Conference (CEI) and the Gregorian University in Rome have called for an international congress next November 29-30 called, “Does God not live here anymore? Disposal of places of worship and integrated management of ecclesiastical cultural assets,” to be held at the Jesuit-run campus. Given the massive scope of Church properties around the world, it comes as no surprise that there’s no exact number of struggling and abandoned churches. Secularisation, a decrease in vocations and economic mismanagement have led to significant challenges for many parishes worldwide, and speakers at the press event said that the problem exists in many countries. “We have registered an extraordinary interest by the bishops of various countries,” Cardinal Ravasi said. The congress aims at presenting guidelines on the disposal and reutilisations of the Church’s patrimony. In the next few weeks, delegates from bishops’ conferences in Europe, North America and Oceania will discuss and approve the document.